We are delighted that you have chosen Greensboro, North Carolina as your home away from home. The International Programs Center works diligently to support all of our incoming international degree-seeking and exchange students, as well as welcoming visiting international scholars to campus. Our staff is dedicated to making your transition to the U.S. as smooth and inviting as possible. Select any of the following links to get started, and please contact us if you have any questions! 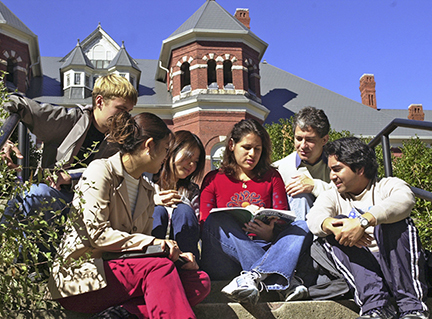 International students studying in front of the Foust building on the U.N.C.G. campus. Take a virtual tour of U.N.C.G.’s beautiful campus, discover housing options for students and scholars, and learn ways to get involved! Find all information for newly admitted, currently enrolled, and recently graduated degree-seeking international students. Exchange students from our partner universities can learn more about their arrival to Greensboro and exchange student orientation. Our staff are here to guide J-1 scholars through compliance with all federal rules and regulations, and acclimate to life at U.N.C. Greensboro. Navigating the visa application process can be intimidating, but we’re here to help! Check out this section to learn more about the process to apply for or renew your visa, and how to be prepared for arriving to the port of entry. U.N.C. Greensboro and the surrounding community offer a number of helpful resources to international students and scholars. This section will help you to learn more about academic and other support resources available.